…with three models, a good idea and a touch of magical artistic energy. The representation of a seahorse brought countless hours of work for 10 people. The elaboration of the idea, design, make-up, set, photos, cut and illustration…. Bodypainting and photo shooting were, thanks to perfect preparation, realized in only 10 hours. 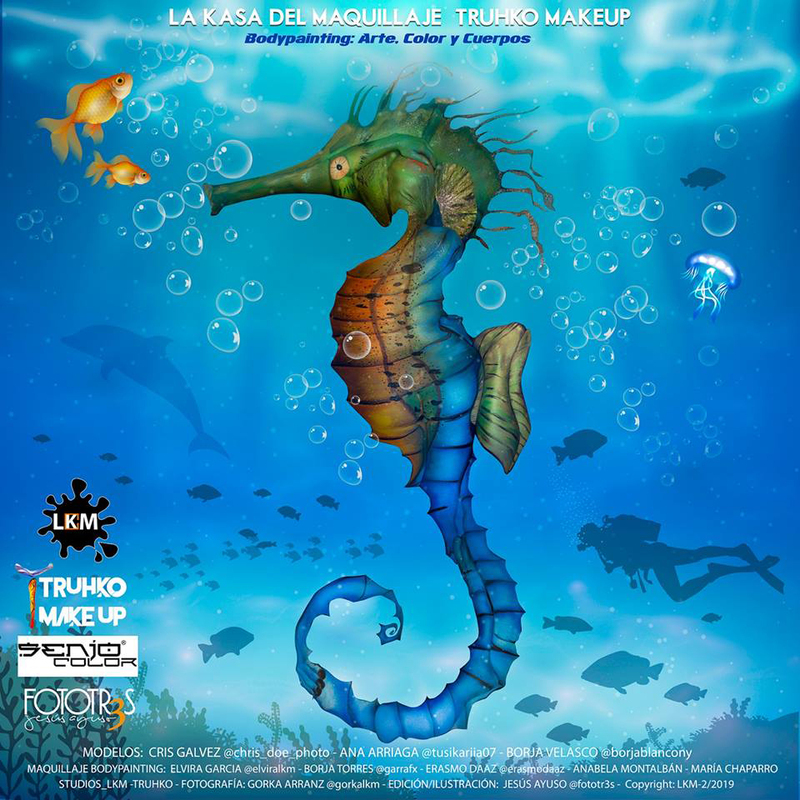 On December 22 last year Gorka Arranz -LKM, Elvira Garcia -TRUHKOMakeup and Erasmo Daaz -Senjo Color Spain came together to visualize a great project for the start of an artistic 2019. Through the destruction of subterranean sea grass forests and the catch in Asia for the healing powers, the seahorse is now one of the threatened species of this world. The art of body painting is just as ephemeral. Alive for eternity only through photography. 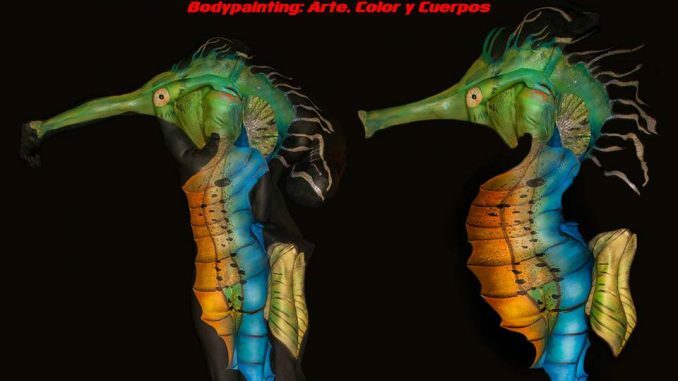 The execution of a 3D BodyPainting with several bodies is undoubtedly one of the most complex tasks within this body art. The first challenge was to harmonize the bodies within the composition. To emphasize the body parts that are important and to visually remove unnecessary body elements from the image. The implementation of the design into reality. Perhaps the most delicate phase in this group community process. The slightest error in this phase can complicate work for several hours and, in the worst case, ruin it. Can the models be placed according to the design? What poses do they take and how long can they stand it? This phase starts directly with the body painting after the design from phase 2. In 10 hours it will only be certain whether the design, planning and implementation were successful. With sponge, brush and airbrush we went to work. LKM is the paradise for body artists in Spain. In the heart of Madrid you will find everything you need for this art form. Of course Senjo Color also makes an important contribution to the supply of exclusive artist material for make-up artists and body painters. We did it. The result is impressive! The models perfectly painted, the arrangement perfectly staged. The homage to the seahorse was a complete success. The artists go home happy and proud. Full of new ideas for next projects. But also visibly exhausted from a very long project day.